I'm starting my New Year's resolutions a teensy bit late. I mean, I'm going to start keeping them as of... now! I vowed to blog six -- er, five days a week, and now I"m going to keep it! Wednesdays we wear pink. Kidding! Love that movie, though! Wednesdays we talk Weddings. 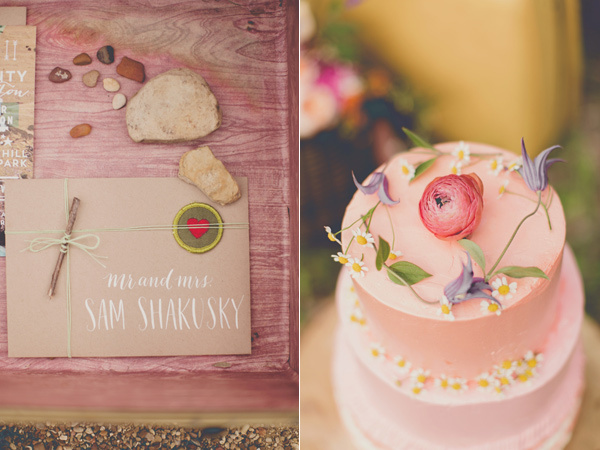 Today I have for you paper elements from a Moonrise Kingdom-inspired wedding! I keep wanting to say Moonshine... wow, where is my head? I was approached to do this open house by my lovely and wonderful friend Rachel of butter & bloom to be a part of this super fun Moonrisey (yup, just made up a word!) evening, just after the Seattle Wedding Show weekend ended. The event coordinator she was working with, Holly of Perfectly Posh Events, was looking for a stationer, and bam! Rach got me in. Thanks, Rach! SO ADORABLE, right?! The sweetness of these photos cannot be contained! So, away I went to work and started creating. It's going to get real cute up in here! Next I started creating the favor boxes. I used paper bag boxes and used some really gorgeous fine paper and bright circle stickers with the same lettering. Yes, the pretend bride and groom were named Sam and Suzy. By chance. Just kidding. It was planned! Isn't this fine paper gorgeous? The yellow and orange really complemented the floral pieces by butter & bloom, which you'll see down below! Again, I used paper bag for the menus and a bright purple ribbon to accent and bring in 2014's Pantone Color of the Year, Radiant Orchid! Gorgeous. Here's how the whole table looked, including the vibrant centerpieces Rachel put together! And so that was that! Tomorrow I'll have to post some more photos, but tomorrow will be Thursday How-To. Might have to make an addendum to this guy and add some more photos after the fact. You'll have to check back later to find some more awesome Moonrise Kingdom-inspired wedding paper creations! Thanks for reading! Hopefully this inspired you to add fun color to your wedding a la Moonrise!